We are committed to positive training, especially of bully and other large breeds. We want to change the public perception of these dogs. We offer in-home evaluations and training to meet the needs of the dogs and their owners. Our mission is to extend positive reinforcement training into the "strong breed" world of dog training. We will take our experience with large breed dogs and adapt that to fit the needs of the client and his or her dog. Reality is, if the client is not comfortable with the training then it won't work. We all need to be on the same page - for the benefit of the dog. Training is an important part of dog ownership and having a support system you can trust, in the form of your trainer, is vital. Certified Dog Trainer Maura Porter, CPDT-KA has years of experience with positive reinforcement training and techniques with dogs of all breeds. She has volunteered at animal shelters where (in all honesty) the best training in the world can be found, with the dogs who need it the most. Maura is an AKC Canine Good Citizen evaluator and a Dog BONES of Massachusetts therapy dog certification instructor. Maura Porter is also the owner of one of the northeast's best known therapy dogs: Blueberry the Pit Bull Therapy Dog. This team has years of experience changing minds one visit at a time, and this experience has given both dog & handler valuable insight into the world of therapy dogs, as well as pit bull bias. Visit Blueberry the Pit Bull Therapy Dog on her Facebook page here! Trainers who work with Maura all have experience with positive reinforcement training and strong breeds. 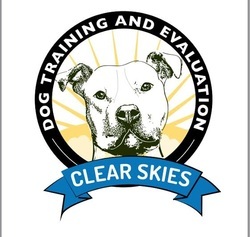 So if you are looking for an outside-the-box trainer with both bully breed experience, real world & therapy dog credentials, this is just one more reason to reach out to Clear Skies Dog Training. We serve mainly the South Shore, however we do travel to the North Shore and Southeast Region of Massachusetts. Ask about our very competitive travel fees. In addition, we have great affinity for all shelter and rescue dogs as well as the pups' new owners - we offer 25% off the first training session for all dogs who were adopted from a shelter or a rescue. Training is an important part of owning a dog and having trainers who you can trust and rely on is vital. Contact us at clearskiesdogtraining@gmail.com or call us at 781-724-5610 for more information. Thank you. Thanks again for visiting! We'd love to meet you.